Despite the fact that this game was played only in the 3rd round, I think, it had perhaps the most decisive influence on my further performance. After 2 rounds the author of these lines had 50 % and had 5 encounters as Black against possessors of highest chess title ahead. It was time not to think about great tournament aims, but about the "face-work". In this encounter my opponent is Alexei Lugovoi, active chessplayer, "who plays himself and give his opponent an opportunity to play", therefore, still there was a certain chance to strike up a sharp struggle. 1.d4 d5 2.c4 e6 3.¤f3 ¤f6 4.¤c3 c6 5.e3 ¤bd7. We see the Meran variation on the board. According to the last games Black has not to suffer from fatal problems. 6.Ґd3 [6.Јc2!?] 6...dxc4 7.Ґxc4 b5 8.Ґd3 a6 9.e4 c5 10.e5. Sharp positions usually arise after this move. 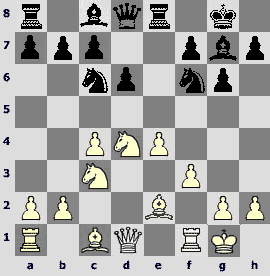 The black king remains in the centre, the queenside is destroyed. In return Black receives a pawn fist and a rich pieces' play. 10...cxd4 11.¤xb5 axb5 [11...¤g4?! 12.Јa4 Ґb7 13.¤bxd4 Јb6 14.0–0 Ґc5 15.h3 Ґxf3 16.hxg4 Ґd5 17.¤f3 Јb7 18.Јf4 0–0 19.g5 g6 20.b3 a5 21.Ґd2± Moiseenko – Hector, Plovdiv 2003; 11...¤xe5] 12.exf6 gxf6!? 13.0–0 Јb6 14.Јe2 b4. Another continuation is 14...Ґa6 15.¦d1 ¦d8 16.b4 Ґxb4 17.¦b1 Ґc3 18.a4 ¤c5 19.Ґxb5+ Ґxb5 20.¦xb5 Јa6 21.g3 d3 22.Јf1 Јc6 23.Ґa3 Јxf3 24.Ґxc5 Јe4 25.a5 ¦g8 26.a6 ¦g5 27.a7 d2 28.Ґe3 ¦gd5 29.¦b8 Јa4 30.Ґb6 Ґd4 31.a8ЈЈxa8 32.¦xa8 ¦xa8 33.Ґxd4 1–0 Milov – Borovikov, Dos Hermanas 2004. 15.¦d1 Ґc5. All these moves are already known in the modern theory. This continuation is relatively rare. Black does not hurry to move the bishop on c8, while he activates the kingside. 17.Ґg3 [17.Ґe4 Ґa6 18.Јd2 ¦d8„ Huzman – Bocharov 2004] 17...¦g8 [17...Ґb7!? 18.Ґb5 ¦d8 19.¦ac1 ¦g8 20.¦xc5 Јxc5 21.¤xd4 ¦xg3 22.hxg3 ўe7 23.¤b3 Јg5 24.Јc4 Јg4 1–0 Filippov – Vaganian 2004] 18.¤d2. 18.¦ac1 leads the game to the encounter Milov – Filippov that had following continuation 18...¦xa2 19.Ґb5 ўe7 20.¤xd4 Ґxd4 21.Јc4 ¦xg3 22.hxg3 Ґxf2+ 23.ўh1 ¦xb2 24.Јxc8 Јxb5°. 18...h4!? Black wins tempo at cost of a pawn. 18...Ґb7 19.Јxh5 f5 20.¦e1 (20.Јh7 ¤f6 21.Јh4 ¤g4) 20...Ґe7 [20...f4 21.¤c4 Јc6 (21...¤f6 22.¤xb6 ¤xh5 23.¤xa8 Ґxa8 24.¦e5ќ) 22.Ґe4 Јxe4 23.¦xe4 Ґxe4 24.¤e5±] 21.¤c4 Јc6 22.f3 ¤f6 23.Јh6 ¦g6 (23...¤d5 24.¤e5ѓ; 23...¤g4!? 24.Јd2 ¤e3 25.¤xe3 dxe3 26.Јe2 ўf8 27.¦ac1 Јb6 28.Ґf4 Ґg5›) 24.Јd2 ¤d7›. 19.Ґxh4. 19.¤c4 Јb7 20.Ґe4 hxg3 21.Ґxb7 gxf2+ 22.ўf1 Ґxb7 23.g3 ¦g5 (23...Ґa6 24.b3; 23...¦h8 24.Јxf2 ¦h5 25.g4 ¦h3 26.ўe1), and Black has a good compensation for a queen – 24.¦xd4?! Ґxd4 25.¤d6+ ўf8 26.¤xb7 ¦d5і. 19...Ґb7 20.Ґg3 ¤e5 21.¤e4. Unsuccessfulis21.Ґe4 d3 22.Јe1 (22.Ґxd3 ¤xd3 23.Јxd3 Ґxf2+°) 22...¦xg3 23.Ґxb7 ¤g4 24.¤e4 ¤xf2! 25.¤xf2 [25.¤xc5 ¤xd1 26.¦xd1 (26.Јxd1 Јxc5+ 27.ўh1 ¦d8 28.hxg3 ўe7°) 26...Јxc5+ 27.Јf2 Јc2 28.¦f1 d2 (28...¦b8 29.Јa7 ¦d8 30.hxg3 d2 31.Ґf3 d1Ј 32.Ґxd1 ¦xd1 33.Јb8+ ¦d8 34.Јxb4 ¦d2=) 29.Јxf6 Јc5+! (29...¦d3 30.Јxf7+ ўd8 31.Јf8+ ўc7 32.Ґxa8 d1Ј 33.Ґe4! Јxf1+ 34.Јxf1і) 30.ўh1 ¦d3 31.Јxf7+ ўd8µ] 25...¦e3 26.Јxe3 Ґxe3 27.Ґxa8 Ґxf2+ 28.ўh1 Јd4µ. 21...Ґe7 22.Ґxe5. Preserving the light-squared bishop. Worse is 22.Ґb5+ ўf8 23.a4 bxa3 24.bxa3 f5! 22...fxe5 23.¤g3 ¦a5 24.a4 Јd6. Winning a pawn after 24...bxa3 25.bxa3 Ґxa3© has no immediate refutation, but passes the initiative to White for a long time. 25.Ґb5+. A wrong square. Regardless of the fact that black rook is being "cut out", the bishop on b5 is located worse than on d3. 25.¦e1!? ўf8 26.Јh5 Ґg5 27.Ґh7 ¦g7 28.Ґe4„. About this time I started to play "on interception", moreover, the opponent suffered the lack of time. 27.f3?! A solid move that is typical for a time trouble. 27...Ґf4?! It is haste. A competent 27...Јe7 28.Јh7 (28.ўh1? Јf6 29.¤e4 Ґxe4 30.fxe4 ¦h8°) 28...Ґf4 29.¦ac1 ¦a8 leads to a better version of what has happened in the game (29...Ґe3+ 30.ўh1 Ґxc1 31.¦xc1 Јd8). 28.¤e4 Јe7 29.¦ac1! ¦a8, bringing a rook into the action. The rook is inviolable: 29...Ґxc1? 30.¦xc1 f5 31.¤f6!ѓ. 30.¤c5 ¦d8. A forced variation after 30...f5?! 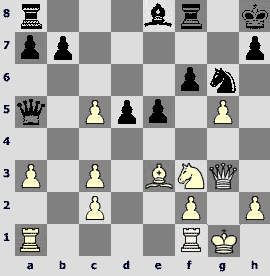 31.¤d7+ ўg7 32.¦c7 ¦h8 33.¤xe5 ¦xh5 34.¦xe7+ ўf6 35.¦xb7 Ґxh2+ 36.ўf2 Ґxe5 leads to an advantage of White. Black still did not decide what he wants – to mate or to win material, therefore, black queen runs between two flanks like crazy. 35...Јc2!? 36.Јe2 Јh7 37.g4 ¦h8 38.Ґd3 Ґxh2+ 39.ўf1 Јh6µ. 36.g3. After this move the situation is hopeless for White, however, the annotator failed to find anything better, e.g. : 36.Јxb3 Јh4 37.g3 Ґxg3 38.Јa3+ ўg7 39.hxg3 Јxg3+ 40.ўf1 ¦h8°. 36...Јh4 [36...Ґxg3! 37.hxg3 ¦xg3+ 38.ўf2 Јg5 39.¦h1 ¦g2+ 40.ўe1 ¦c2°] 37.Јe4 Ґxg3?? This case is quite rare – Black misses an opportunity to mate by force – 37...¦xg3+ 38.hxg3 Јxg3+ 39.ўf1 Јh3+ 40.ўe1 Јh1+ 41.ўf2 (41.Ґf1 Јh4+! – this check "backwards" has escaped my attention – 42.ўe2 Јh2+ 43.ўd3 Јc2#) 41...Јh2+ 42.ўf1 Ґe3°. 38.Јxh4 Ґxh4+ 39.ўf1 ўe7?! [39...Ґg5!] 40.¦c1? Making a control move White loses a very important tempo. Why not 40.a5! 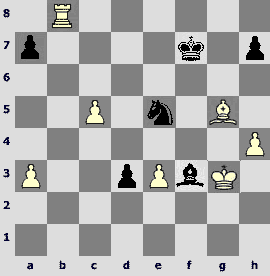 ?, and no more than a draw is seen for Black: 40...Ґg5 41.a6 Ґe3 42.a7 ¦a8 43.¦a1 d3 44.Ґxd3 ¦xa7=. 43...Ґf6?? Black rightly rejects the variation 43...Ґg5 44.¦c6 (44.¦c7+ ўf6 45.fxe4 fxe4 46.¦c6) 44...Ґe3 45.¦xe6+ ўf7 (45...ўxe6 46.Ґc4+ ўe5 47.Ґxg8 Ґxa7 48.fxe4 fxe4 49.Ґxb3 – this position seems to have arisen by force and White seems not to be able to retain it, e.g. 49...Ґd4 50.Ґf7 Ґxb2 51.h4 e3 52.Ґh5 ўd4 53.Ґd1 ўc3 54.ўe1 Ґa3 55.h5 Ґb4°) 46.Ґxd3!, and White holds in a studying manner. 44.¦c7+ ўd6 45.¦c6+ ўd5 46.¦xe6 Ґd4 [46...ўxe6 47.Ґc4+ ўe7 48.Ґxg8 e3 49.a8Ј e2+ 50.ўg2 e1Ј 51.Јb7+ ўd8 52.Јb6+ќ] 47.¦g6!ќ ¦f8. Such is the chess game – you were mating during 10 moves and now you have to give a rook for the opponent's passer. Black tries to catch an accidental chance – nevertheless, while the white bishop is out of play, far advanced pawns looks threateningly. 51.f4+! Very precisely. 51...ўxf4 52.¦g3?? Now it is turn of White to make a mistake. 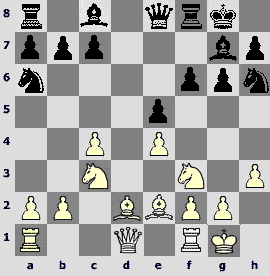 52.¦d6 could end the encounter: 52...e2+ 53.ўe1 ўe3 54.¦xd4 ўxd4 55.ўd2ќ, and black pawns are powerless without support of bishop. 52...e2+ 53.ўe1 Ґc3+! It is a tactical trick. That evening the fortune was on the side of the debutants of the city championship. What a triumph of the black infantry that has brought through! 1.e4 e6 2.d4 d5 3.¤c3 Ґb4 4.e5 ¤e7 5.a3 Ґxc3+ 6.bxc3 c5 7.Јg4 0–0 8.Ґd3 ¤bc6 9.Јh5 ¤g6 10.¤f3 Јc7 11.Ґe3 ¤ce7. The annotator kept silence heretofore, not because he has nothing to say. Simply the parties have not demonstrated any theoretical revelations, however, there were many branches at each move, but it is not possible to analyze all of them fully. The governor of the white pieces has lost his feeling of reality and allowed himself to play such tricks. However, he can justify himself with the friendly status of the game and with the fact that no forced loss after this move can be seen. 12.h4 ¤f5 13.g4 ¤xe3 14.fxe3 cxd4 15.0–0 f6 16.cxd4 Ґd7 17.exf6 Јg3+ 18.ўh1 ¦xf6 19.¤g5 Јxh4+ 20.Јxh4 ¤xh4 21.Ґxh7+ ўh8 22.Ґd3 ¦af8 23.ўh2 ¤f3+= Cheparinov – Fernandez Romero, Dos Hermanas 2005. 12...b6?! 13.¤g5 h6 14.¤f3 cxd4 (14...a5 15.dxc5! ?, though 15.0–0 is also possible) 15.cxd4 a5 16.0–0 [16.g5? Јc3+ 17.ўe2 Ґa6 18.Ґxa6 ¦xa6 19.gxh6 Јxc2+ 20.¤d2 ¤f5 21.¦hc1 (21.¦ac1 ¤xd4+ 22.Ґxd4 Јxc1°) 21...Јa4 22.¤f3 (22.hxg7 ¤xd4+ 23.ўf1 ¦e8 24.¦c7 ¤f5і) 22...gxh6і] 16...¦e8 (16...Ґa6 17.Ґxh6! Ґxd3 18.cxd3 gxh6 19.Јxh6 ¦fc8 20.¤g5‚) 17.Ґxh6 gxh6 18.Јxh6 ¤f8 19.¤g5 ¤eg6 20.f4 Јc3 [20...Ґa6 21.f5 exf5 22.gxf5 Ґxd3 23.¤h7! !ќ (23.f6! ?ќ ¤e6 24.cxd3)] 21.¤f3 (21.f5 Јxd4+ 22.ўh1 exf5 23.gxf5 Ґxf5 24.Ґxf5 Јh4 25.¤xf7 Јxh6 26.¤xh6+ ўg7Іwith an unstable advantage of White in the endgame) 21...Ґa6 22.f5 exf5 23.gxf5 Ґxd3 24.cxd3 Јxd3 25.fxg6 fxg6І. 13.¤g5?! h6 14.¤f3 Јa5 15.Ґd2 (15.0–0 Ґb5 16.Ґxh6 Ґxd3 17.cxd3 Јxc3і) 15...c4!? (15...¤f4 16.Ґxf4 Јxc3+ 17.ўe2 c4 18.Ґd2 cxd3+ 19.cxd3 Јc7 20.Ґxh6! gxh6 21.Јxh6ќ) 16.Ґf1 f6 17.exf6 [17.¦g1 ¤f4 18.Јh4 ¤eg6 19.Јg3 fxe5 20.¤xe5 (20.dxe5 Јc7µ) 20...¤xe5 21.dxe5 g5!і] 17...¦xf6 with a good play of Black. 13...f6 14.Ґd4 Ґe8 15.Јh3. The following variation deserves the most scrupulous attention – 15.0–0!? ¤c6 16.¦ae1 Јe7 17.exf6 (17.Јh3 f5!) 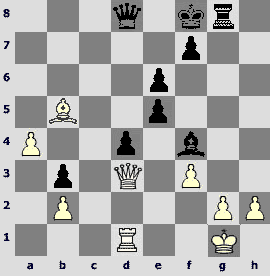 17...gxf6 18.Јh6 e5 19.¤h4І, and a powerful pawn centre is an insufficient compensation for a sacrificed pawn. 15...¤c6. The pawn is inviolable: 15...fxe5 16.¤xe5 ¤xe5 17.Ґxh7+ ўf7 18.f4 ¤5g6 19.Јh5 ¦h8 20.f5 e5. It seems that the white bishop stuck on h7 and Black will launch a counterattack, but even here the variations are "growing together" in favor of White – 21.0–0! exd4 22.¦ae1ќ. 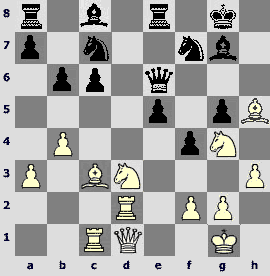 3 moves back the author of these lines has eagerly put the bishop on d4, and now it is such an embarrassing situation – he has to retreat in a coward manner. 17...e5. Of course, the classics of the ancient game would greet this advance towards the center, but he probably had to preserve the elasticity of structure. There was nothing shameful in pawn-grabbing – 17...Јa5!? 18.0–0 Јxc3 19.¦ab1 Јxa3!? 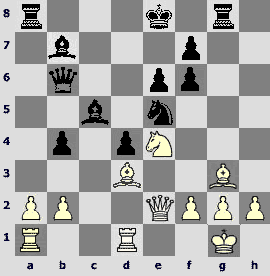 20.¦xb7 ¦f7„, and if White does not succeed in the attack on the king, than the a-passer will guarantee him a "dolce vita". 18.Ґf5. I can easily admit that this move is not the strongest one in the position (probably, it is even not a strong one), but I wanted to seize the released square, and also the f5-bishop is so beautifully located! 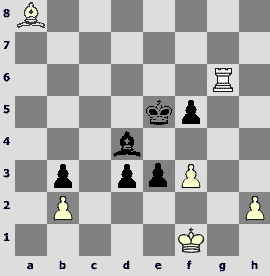 White has an alternative – 18.¤d2! ?, but how many times is it possible to play backwards? 18...¤ce7?! This is an unjustified sacrifice of exchange, which White does not accept. 18...Јa5 19.0–0 Јxc3 20.¦ab1 ¦b8 still is not bad, however, here White must not give the b7-pawn in view of the repugnant bishop on f5 – 21.¦b3І. 19.Јg3? What is it – a momentary "blind spot" or generally weak tactical vision? However, why would the reader entertain himself with such difficult questions? His aim is to read the article, and the author should think about it... 19.Ґh6! Јxc5 20.¤d2 ¤f4 (20...Ґc6 21.¤b3 Јd6 22.Ґxf8 ¦xf8 23.¦g1±) 21.Ґxh7+ ўxh7 22.Ґxf4+ ўg8 23.Ґh6±. 19...Јa5 20.0–0 ўh8. 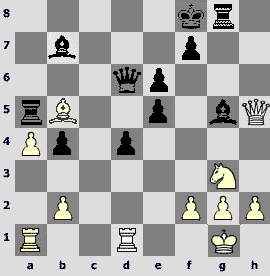 Having quite good position, Black can avoid sacrificing material –20...Јxc3 21.Ґh6 ¦f7 22.Ґe6 Јxc2 23.¦ab1 ¦b8©. 21.Ґxg6 [21.Ґh6 ¤f4 (21...¤xf5 22.gxf5 ¦g8 23.Ґg5 Јd8! 24.fxg6 ¦xg6 25.h4 ¦g7›) 22.Ґxf4 ¤xf5 23.gxf5 exf4 24.Јxf4 Јxc3 25.¤d4 Ґh5 26.f3„] 21...¤xg6 22.g5?! 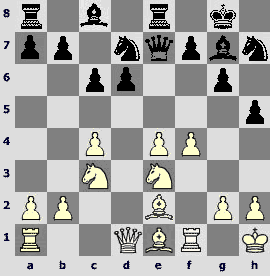 I cannot annotate the actions of White in this game from the rational standpoint – firstly he moves the bishop hither and thither, then beautifully brings over the other bishop, but in some moves exchanges it for one of the knights that are doubling each other, and now there is a next trick – an attempt to open the file, on which his queen and king are standing. 22...¦g8 [22...Јxc3! 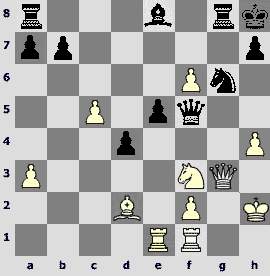 poses almost unsolvable problems to White – 23.Ґd2 Јxc2 24.gxf6 ¦xf6 25.Ґg5 (25.¦ac1? Јf5°) 25...¦f5µ. 23.h4!? The purpose of this move is not only to threaten the further pawn's advancement, but rather to ensure the place on h2 for the king. 24...d4 25.Ґd2 Јxc2. Yet Black plays simply and strongly. 26.gxf6 Јf5. It seems that harder is 26...¤f4! 27.¤g5 [27.Ґxf4!? ¦xg3 28.Ґxg3 Јxc5 29.¤xe5µ, and the position is not too easy even at the moment, however, it is certainly bad for White (29.Ґxe5 Ґf7 30.¦ad1 ¦e8!)] 27...Јxd2 28.f7 ¦f8 29.¦g1 Јd3 30.¤f3 ¤g6 31.h5 ¦xf7 32.hxg6 Јxg6 33.Јxe5+ Јf6 34.Јxf6+ ¦xf6 35.¤xd4 ¦xf2+µ. 27...Ґc6?! Black loses his advantage. 27...¤f4!? 28.¤g5 (28.¦xe5 ¦xg3 29.¦xf5 ¦h3+ 30.ўg1 Ґc6 31.Ґxf4 Ґxf3 32.Ґh2 ¦g8+ 33.¦g5 d3°) 28...Јxf6 29.Ґxf4 exf4 30.Јf3 ¦xg5 (30...h6 31.¦e6 Јg7 32.¦g1!‚) 31.hxg5 Јxg5і, and Black has better chances thanks to the d-passer. 28.f7?! When White does not accept an offered draw, he adds fuel to a fire. It is not easy to annotate the further events – they happened in a tough mutual time trouble, therefore, I will mention only the evident mistakes. 28.¤xe5!? ¤xe5 29.¦xe5 ¦xg3 30.¦xf5, and the advantage is already on White's side. 28...Јxf3? To my mind, it is always better to play the position with an exchange deficit with queens on board, also because the white king is also weak. 40.e4? [40.¦d8!] 40...Ґxe4 41.ўf2?! [41.¦d8!?] 41...¤c4 42.ўe1? [why not 42.¦d8 ?] 42...ўe6?! [42...¤xa3! ?±] 43.¦e8+ ўd5 44.c6ќ. The time trouble ended. The further events are clear. Reader, please do not judge the author harshly – he perfectly understands that it looks a bit strange, when he gives the encounters, in which both parties make more than one mistake. However, you can't help it, because the annotator chooses the games himself and for him the most attractive games are though not faultless, but very vivid, I can even name them "humane", because they are so clear and intimate. This game was played in the Russian junior championship, and this left a certain mark on it. Which one? By no means intending to offend the participants and the winners of the tournament I will mention the following. First of all, there is an opponent-specific preparation, and the primary importance is assigned to the wish to surprise him in the opening with not necessarily the strongest, but rather unknown continuation. The struggle in a game is usually long-lasting and tough. Fighting spirit and stability of one's nervous system plays an important role. However, for all that the variations are usually not calculated till the end; the blunders take place even in technical positions. The following encounter is typical for such kind of tournaments: White was surprised already on the 8th move, the same happened with Black on the 10th move. 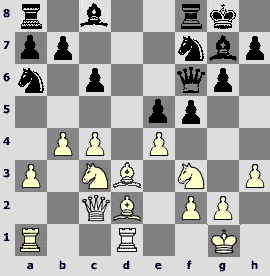 Later on mysterious maneuvers were made by both players, till White instinctively ventured to sacrificing a piece. This sacrifice turned out to be unexpectedly strong, the plain location of white pieces suddenly found harmony and ... the game ended. 10.¤c2. It is not the most principled. We should admit that the main way is 10.Ґe3!? ¤h5 11.Јd2 ¤f4 12.¤xc6 ¤xe2+ 13.¤xe2 bxc6 14.Ґd4 c5 15.Ґxg7 ўxg7 16.Јa5 Ґb7 17.¦ae1 Ґc6 18.b3 ўg8 19.¤c3 Јb8 20.¤d1 ¦e7 21.Јd2 a5 22.¤e3 Јf8 23.¦e2 Јg7 24.¦fe1 a4„ Lastin – Khairullin, Tomsk 2004. 10...¤e5. The knight is beautifully located in the centre; however, it could be more useful on the other edge of the board. Closer to the idea looks 10...¤h5!? 11.¤d5 f5 12.exf5 Ґxf5 13.Ґd3 Ґxd3 14.Јxd3 ¤e5 15.Јb3 c6 16.¤f4 ¤xf4 17.Ґxf4 Јb6+ 18.Ґe3 Јxb3 19.axb3 a6 20.¦ad1 ¤f7 21.Ґd4 ¦e2 22.¦f2 ¦ae8 23.ўf1 ¦2e7 24.Ґxg7 ўxg7 25.¦fd2 ¦e5 26.¤d4 ¦e3= Krasenkow – Blehm, Krymnica 1997. 11.¤e3. At least it is a paradoxical maneuver. The author of these lines for some reason was very scared of the d6-d5 breakthrough and took appropriate measures beforehand. 11.Ґg5!? h6 12.Ґh4 g5 13.Ґf2 Ґe6 14.¤e3 c6 15.Јd2 Јc7 16.¦fd1 ¦ad8 17.¦ac1 Ґc8 18.¤c2 ¤h5 19.¤d4 ¤f4 20.Ґe3 ¤xe2+ 21.¤cxe2 f5 22.exf5 Јf7 23.b3 d5 24.c5 Ґxf5 25.h4 gxh4 26.Ґxh6 Ґxh6 27.Јxh6 Јg6 28.Јxh4 1–0 Voitkevich – Pedzikh 1996. 11...c6 12.ўh1. This move is usually made due either to an absolute necessity, or, as in this case, in order to pass the turn to move to the opponent. 12...h5. It is always tempting to move the edge pawn – the minimum number of squares is weakened. Here the move is not bad, however, only in combination with further advance. 13.Ґd2. It is ugly, but White has to develop somehow. 13...Јe7?! [13...h4!? 14.Ґe1 h3 15.g3 Јe7„] 14.Ґe1. The white bishop wants to seize a very comfortable h4-square, wherefrom no one would drive him away. 14...¤h7? It is clear why Black does not want to allow an unpleasant pin, but the h7-square is obviously not for the knight. 14...a6!? 15.Ґh4 b5 16.f4 ¤ed7 17.Ґf3 Ґb7›. 16.Ґxh5! 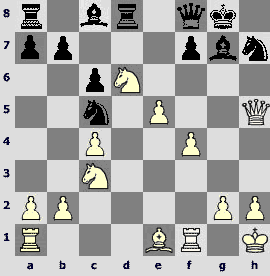 For a bishop White receives a strong knight on d6, two pawns and most likely another one. In addition to all this the light pieces of Black occupy too passive positions. 16...gxh5 17.¤f5 Јf8. Perhaps, he should find a more active location for the queen – 17...Јe6 18.¤xd6 ¦d8 19.e5 (19.Ґh4?! Ґf6) 19...¤df6 20.Ґh4. 18.¤xd6 ¦d8. After 18...¦e6 19.e5 the active rook is hardly an advantage of Black's position. 19.e5. 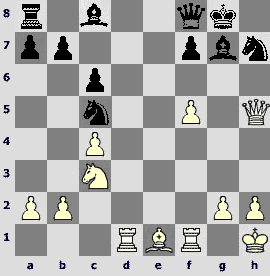 Obviously it is unfavorable for White to exchange the bishops: 19.Ґh4?! Ґf6 20.Ґxf6 ¤dxf6 21.e5 ¤e8 22.c5 Ґg4„. 19...¤c5. It seems that he should have sacrificed a piece – 19...¤xe5!? 20.fxe5 Ґxe5 21.c5 Ґg4 22.Јb3 Ґxd6 23.cxd6 ¦xd6 24.Јxb7 ¦b8 25.Јxa7 ¦xb2 26.¦f2І– White has a very dangerous passed pawn, and the black king is very weak. The advantage of White became arranged. The d6-knight hinders the black army. Black makes a desperate attempt to get free, but the pieces of his queenside will never enter the play. 20...¦xd6 [20...f5 21.¦d1 Ґe6 22.b3±] 21.exd6 Јxd6. The blockade idea is also interesting 21...f5!? 22.¦d1 ¤f6 23.Јg6 Ґe6 24.Ґf2 ¤cd7±, and it is still not so easy to break through. After this White has only to make everything with an elementary accuracy. His bishop and rooks break out; the light pieces of Black are extremely straitened. 23...¤f6 24.Јh4. 24.Јf3!? could totally freeze the queenside. 24...b5 25.Ґg3 ¤b7 [25...¤cd7 26.Ґd6 Јd8 27.c5ќ] 26.Ґe5 Јe7 27.Ґd4 c5 [27...b4 28.¦fe1 Јf8 29.Ґxf6ќ] 28.¦fe1 Јxe1+. The sacrifice that was not accounted by White does not save Black. The last round of an ordinary open. We can easily guess who is an obvious favorite. Dark horse's advantages are color, favorite's expected exaggerated yearning for a victory and of course specific of the last round. 1.¤f3 ¤f6 2.c4 g6 3.¤c3 Ґg7. 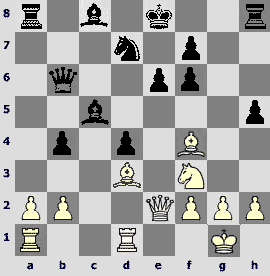 White aimed to "dry" the play in the anti-Gruenfeld – but it was far from it! Did you expect the King's Indian? 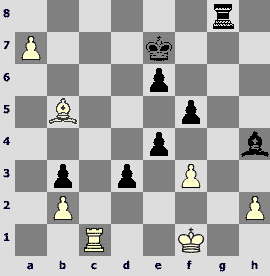 4.e4 d6 5.d4 0–0 6.Ґe2 ¤a6 7.0–0 e5 8.Ґe3 ¤g4 9.Ґg5 Јe8 10.dxe5 dxe5 11.h3 f6!? Interesting move. Black plans to move the king's knight on f7. 11...h6 12.Ґd2 ¤f6 13.Ґe3 Јe7 14.a3 c6 15.b4 ¦d8 16.Јc2 ¤h5 17.¦fd1 ¤f4 18.Ґf1 ¦xd1 19.¦xd1 Јf6 20.Ґxf4 exf4 21.e5 Јe7 22.Јd2 Ґf5 23.Јxf4ІIzoria – Glek, France 2004. 13.a3. Frankly speaking, it is not the strongest continuation. 13.c5!? ¤xc5 14.Јc1 ¤f7 15.¤d5 ¤e6 16.¤xc7 ¤xc7 17.Јxc7 ¤d8 18.¦fc1 Ґe6 19.b4 ¦f7 20.Јc3 Ґf8 21.Јb2 Јa4 22.Ґd1 Јd7 23.a4 ¦c8 24.Ґe3 b6 25.Ґb3 ¤c6 26.Ґd2 ¤d8 27.Јa2 ¦xc1+ 28.¦xc1 Ґxb3 29.Јxb3 Јe6 30.Јc2 ¦d7 31.Јc8ІM. Gurevich – Yurjela, Capppelle-la-Grande 2005. A reluctance to bring the queen to this square is very understandable – the black knight is itching to move along the way a6-c7-e6-d4, and here the queen has to be put on the vulnerable square... 15.c5 ¤c7 16.¤a4!? with transposition of moves could bring the game to the encounter Shipov – Motylev, Internet 2004: 16...¤e6 17.¤b2 f5 18.Ґd3 ¤f4 19.Ґc4 Ґe6 20.exf5 gxf5 21.Ґxf4 Ґxc4 22.¤xc4 exf4 23.¦e1І. 15...Јe7?! 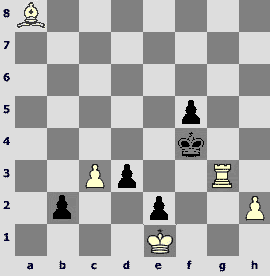 "Lifting up" the position, Black brings his the queen on the same diagonal as his rook. 15...f5!? deserved attention. 16.¦fd1?! It is already the second time when the move is made by general considerations – White makes no headway, and this led to no good even greater masters. I had to raise more concrete problems to Black by means of 16.¤a4 f5 (16...Ґe6 17.b5 cxb5 18.cxb5 ¦fc8 19.Јb2 ¤c7 20.¦ac1І) 17.b5 fxe4 18.¤h2 ¤c7 19.Ґb4 ¤d6 (19...Јg5 20.Ґg4!І, and White has a more comfortable advantage) 20.¤c3 a5!? (20...¤ce8 21.bxc6 bxc6 22.¤xe4 Ґf5 23.Ґd3І; 20...Ґf5?! 21.g4 Ґe6 22.¤xe4 ¤ce8 23.¦ad1 ¦d8 24.Јd3±) 21.Ґxd6 Јxd6 22.¤xe4 Јe7 23.b6!? (23.¤f3 Ґf5„) 23...¤e6 24.c5І. Black has created a fight for three results, he has only to bring up the knight from a6 and he can launch an operation on the kingside. 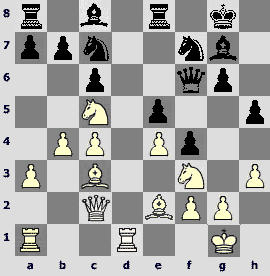 White has nothing to brag about – many of his pieces are wrongly located, and it is unclear where their right places are. With the next move White starts a long-lasting regrouping of his pieces. 18.¤a4!? ¤c7. It is a bit slow. Black seems to have been able to strike up very unclear struggle after 18...¤d6!? 19.Ґc3 fxe4 20.Ґxe4 ¤xe4 21.Јxe4 Ґf5 22.Јe3 ¦ae8„. 19.Ґc3 f4. White has to search urgently for a play in centre. At the same time the plan of Black is evident – a pawn avalanche on the kingside is ready to move. 20.Ґe2. First of all, the d-file becomes free. Your humble servant quarreled with his bread and butter once again – I had to retreat again from the square I had just seized. 20...h5. Black prefers to postpone a crucial move g6-g5 as long as it is possible. It seems that White has failed to achieve anything concrete so far, while the idea of g6-g5-g4 already hangs over the position of the white king as the sword of Damocles. And at this moment White prepares to double his rooks for some reason. What a nonchalance! 22.¦d2! b6 23.¤d3 g5? Here we see an example of the unwarranted victorious mood. 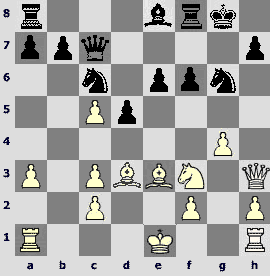 Black wants to crush the opponent with direct moves, and finally he turns out to suffer a strong attack. More interesting is 23...ўh7!? 24.¦ad1 g5 25.Ґxe5 ¤xe5 26.¤dxe5 ¦xe5 27.¤xe5 Јxe5 28.Ґxh5І, establishing an imbalance on board, even though with worse chances. 24.¤h2 Јg6 25.Јd1. Suddenly it became clear that White had cleared the d1-square for the queen. Black accepts a pawn sacrifice casting prudence to the winds. 25...Јxe4? One cannot suffer for a whole game from the lack of counterplay after 25...h4!? 26.¤b2І. Compare this diagram with the previous one. White pieces has arranged a perfect interaction, his play develops naturally and does not require great intellectual work. Black is obviously behind in development. The price of all this is a pawn. 28...¤d5 [28...e4?! 29.Ґxg7 ўxg7 30.Ґxf7 Јxf7 31.¦xc6! ¦e6 (31...Ґxg4 32.Јxg4 ¤e6 33.¤e5ќ) 32.¤de5 Јe7 33.Јc1ќ] 29.Ґxe5! ¤xe5?! It loses straight away. 29...Ґb7!? 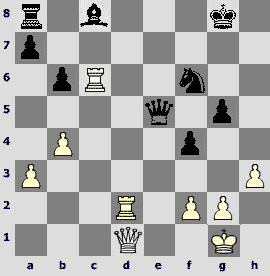 would require some accuracy from White – 30.¦e2 Јf5 31.Ґxg7 ўxg7 32.¤de5! ¤xe5 33.Ґxe8 ¤xg4 (33...¦xe8 34.¦xe5 ¦xe5 35.Јd4ќ) 34.hxg4 Јf6 35.Јe1!ќ. 30.¤dxe5ќҐxe5 31.Ґxe8 [31.¤xe5 Јxe5 32.¦e2 ¤e3 33.Ґxe8ќ] 31...Јxe8 32.¤xe5 Јxe5 33.¦xc6. Heavy artillery of White breaks Black's position. 34.¦e2! 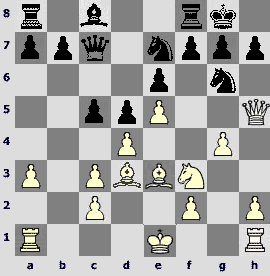 A bit risky – nevertheless, the mate could be avoided – White disregards the position with an extra exchange and a pawn. The prosaic victory 34.¦d8+!? also deserved attention.